Norman Fitzroy Maclean (December 23, 1902 – August 2, 1990) was an American author and scholar noted for his books A River Runs Through It and Other Stories (1976) and Young Men and Fire (1992). The river was cut by the world's great flood and runs over rocks from the basement of time. On some of the rocks are timeless raindrops. Under the rocks are the words, and some of the words are theirs. At a high level of universality, to write anything well, whether it be intellectual or imaginative, is to assume at least two obligations: to be intelligible and to be interesting. Intelligibility, too, has its levels of obligation, on the lowest of individual statements, and even on this level the obligation is never easy to fulfill and perhaps even to genius could be a nightmare if what the genius sought to represent was “madness.” Only to a limited degree, however, can individual statements be intelligible — and in many instances and for a variety of reasons the individual statements are meant to be obscure, as in “mad” speeches. Since full intelligibility depends upon the relations of individual statement to individual statement, the concept of intelligibility, fully expanded, includes order and completeness; for a fully intelligible exposition or poem having relations has parts, and all the parts ought to be there and add up to a whole. The second major obligation, that of being “interesting,” includes unexpectedness and suspense, for expository as well as imaginative writing should not be merely what the reader expected it would be — or why should it be written or read? — and the unexpected should not be immediately and totally announced (in other words, expository and imaginative writing should have suspense), for, if the whole is immediately known, why should the writer or reader proceed farther? But the accomplished writer gives his selected material more than shape — he gives it proper size. For a piece of writing to have its proper size is an excellent thing, or otherwise it would be lacking in intelligibility or interest or both. Scholars are still in search of the exact meaning of certain speeches in each of Shakespeare’s great tragedies — and we should like to assume that those who saw these plays for the first time did not have perfect understanding of all of the lines — but so great was Shakespeare’s power to conceive of action from which thought and feeling can be readily inferred that all of us know Lear, Hamlet, and Macbeth more intimately than we know many men whose remarks we understand perfectly. In our family, there was no clear line between religion and fly fishing. 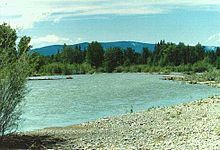 We lived at the junction of great trout rivers in western Montana, and our father was a Presbyterian minister and a fly fisherman who tied his own flies and taught others. He told us about Christ's disciples being fishermen, and we were left to assume, as my brother and I did, that all first-class fishermen on the Sea of Galilee were fly fishermen and that John, the favorite, was a dry-fly fisherman. As a Scot and a Presbyterian, my father believed that man by nature was a mess and had fallen from an original state of grace. Somehow, I early developed the notion that he had done this by falling from a tree. As for my father, I never knew whether he believed God was a mathematician but he certainly believed God could count and that only by picking up God's rhythms were we able to regain power and beauty. Unlike many Presbyterians, he often used the word "beautiful." My father was very sure about certain matters pertaining to the universe. To him, all good things — trout as well as eternal salvation — come by grace and grace comes by art and art does not come easy. Painted on one side of our Sunday school wall were the words, God is Love. We always assumed that these three words were spoken directly to the four of us in our family and had no reference to the world outside, which my brother and I soon discovered was full of bastards, the number increasing rapidly the farther one gets from Missoula, Montana. The brain gives up a lot less easily than the body. "Help," he said "is giving part of yourself to somebody who comes to accept it willingly and needs it badly." One of life's quiet excitements is to stand somewhat apart from yourself and watch yourself softly becoming the author of something beautiful even if it is only a floating ash. Unless we are willing to escape into sentimentality or fantasy, often the best we can do with catastrophes, even our own, is to find out exactly what happened and restore some of the missing parts — hopefully, even the arch to the sky. These words are now part of the story. A mystery of the universe is how it has managed to survive with so much volunteer help. "From the singular appearance of this place I called it the gates of the rocky mountains," Captain Lewis said in his journals. Its singular appearance makes it a fitting backdrop for early and everlasting drama in which nature plays the leading role. In the Gates of the Mountains there have been many blowups. Now there are many rattlesnakes and nothing more fragile than mountain goats, themselves tougher than the mountains they disdain, although at a distance they are white wings of butterflies floating up and down and sideways across the faces of fragments of arches and cliffs, touching but never becoming attached to them. It shouldn't be hard to imagine just what most of the crew must have thought when they first looked across the open hill-side and saw their boss seemingly playing with a matchbook in dry grass. Although the Mann Gulch fire occurred early in the history of the Smokejumpers, it is still their special tragedy, the one in which their crew suffered almost a total loss and the only one in which their loss came from the fire itself. It is also the only fire any member of the Forest Service had ever seen or heard of in which the foreman got out ahead of his crew only to light a fire in advance of the fire he and his crew were trying to escape. In case I hadn't understood him the first time, Sallee repeated, "We thought he must have gone nuts." A few minutes later his fire became more spectacular still, when Sallee, having reached the top of the ridge, looked back and saw the foreman enter his own fire and lie down in its hot ashes to let the main fire pass over him. This was Norman’s remarkable ability — to imagine how highly sophisticated philosophical and critical ideas continually relate to our everyday life. This remarkable synthesis of the intellectual and the practical pervades his writing, transforming the experiences he had in the midst of western mountains and rivers into paradigms of human life and thus accomplishing the ultimate goal of fiction. There is not a writer in the world who will not jump with the shock of recognition when Maclean discerns iambic pentameter in the business of the whorehouse, a second epiphany when everything heard sorted itself into rhythms. … Here Maclean, at seventeen, becomes conscious of the shape of language, the way it falls on the ear. In that whorehouse, ill, dazed, and swimming in and out of consciousness, he became the writer who bloomed fifty-odd years later.